I sowed and the seedling of planting rice sowed the paddy directly to the rice nursery in childhood. 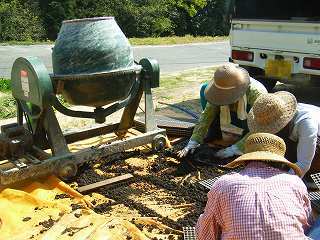 It is the one that the seedling rice is pulled out from the rice nursery by the hand and planting rice was done. However, because planting rice is done with a rice transplanter today, the paddy is not sown to the rice nursery. 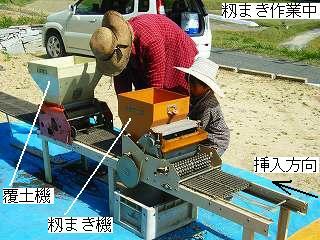 The rice nursery for the pot seedling is built according to the rice transplanter. Because it is the one that the rice transplanter used the pot seedling of "MINORU", the seedling box becomes the one only for the pot seedling in my home, too. The pot seedling is the one (the extraction from the box of the seedling with the small soil called the seedling is pot in planting rice and planting). The number of the seedling is decided beforehand in a word with the box of the seedling. The pot seedling gains a lot of soil to a seedling. Because by one plant belongs under a pot, it is a characteristic that growth after the rice-transplanting is good. There is the method that does not use a pot seedling. I said a mat seedling and I sowed paddy and could be brought up and did only a seedling in the shape of mat. Most of the soil does not stick to a seedling. I plant it while tearing this with rice-transplanting machine. This photograph is putting soil in a pot seedling box. The moderate moisture is necessary for this soil and is too obstinate in the soil which I bought. On this account, with a concrete mixer, I work after mixing water with soil. It is very difficult to mix water equally, and it is an art to mix water little by little. Soil becomes the ball when I pour water at a time. I am not easily restored once when I become the ball. When you do not use the concrete mixer, will you soak it with water with a sprinkling can? The paddy is selected about one week before the paddy rolling and the sword is removed. The bud is put out a little by soaking it to water, and soaking it to remaining the hot water of the bath. Next, it is dried. This photograph is the one that it was taken to connect the paddy rolling machine with the soil covering machine and to use it. Power is human strength. Even four-year-old grandchild seems to manage to turn. The box of the seedling is inserted from the right side of the photograph and the paddy is sown. The paddy is adjusted to enter by about 2-3 per pot. It enters the soil covering machine soon when going out of the paddy rolling machine. It covers on the paddy with the soil with the soil covering machine. The box of the seedling is sometimes caught, and it works while often seeing though it works by full automation. It had covered with the soil in the hand work because there was no soil covering machine before. It is possible to work fast still in the machine. It does with the child and grandchildren every year. The trader often generally puts the paddy rolling work in this vicinity. The trader (farm machines and implements shop) brings the house the machine and it works. Because it is any principle done for myself, these work is done with the machine of independence in my house. Paddy is sown, and after soil covering, the seedling box is displayed to the rice nursery. When the paddy is sown, and the soil covering work ends, the box of the seedling is displayed to the rice nursery. Afterwards, the vinyl sheet for heat insulation is multiplied by the rice nursery. And, water is saved to a box of the seedling close. Each part is oiled before the machine is used. The machine that finished using it is washing off dirt with the brush etc. Wipe the metal part with the cloth which let oil soak lightly not to be rusted. Because a round belt is an articles of consumption, it exchanges it once every several years.